With Thanksgiving quickly approaching I can’t help but think about that holiday season. It’s really my favorite time of the year. I love the family gathering, the festive mood, the traditions, the music, the food — everything. Believe it or not, I even enough the shopping, but I would say that it’s not my favorite thing about Christmas — there, I said the politically incorrect WORD. Christmas. There I said it again. I didn’t mean for this blog to be political, instead I’m writing this blog to tell you about something exciting our family is doing this year that will actually give to orphans in the former Soviet Union. Anastasia before she was adopted and now. As some of you know, my daughter is from Irkutsk, Russia. We adopted her in 2002 from Baby Home #1 in December of that year. In fact, the adoption was official just one day before the New Year. Why is this an important fact? Well, because my daughter wants to give something to her former orphanage at Christmas time, and you can help her. The program is called Project Hope. When you donate $25 at http://www.YouCaring.com/projecthope you can provide more than a Christmas gift to a child without a family at Christmas time. You’re providing the greatest gift of all — the Christ of Christ. Because Russia and other countries in the former Soviet Union don’t allow Christmas gifts to be SENT in to the country, Russian Ministries started a program called, Project Hope, the Great Gift Exchange. The money is collected in the United States and sent to partnering evangelical churches in country. These churches then purchase toys, candy, personal care items and God’s Word. These items are placed in a festive boxes and are then hand delivered by Christians. In partnership with Baptist Bible Church of Irkutsk, my daughter wants to send Project Hope Christmas boxes to all 150 children in her former orphanage. While the goal of $3,750 is a formidable goal, the church has a goal of distributing 1,000 gifts 12 orphanages in Irkutsk. 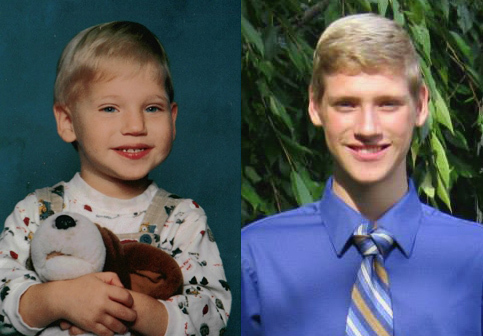 Nikolas Yonker before and now. Anastasia isn’t working alone, however. She’s working with three other families who have adopted children from the same city, who now living in the United States. Niikolas Yonker, Annika Tuls, and Matt and Katie Olsen are joining together to help the Baptist Bible Church accomplish their goal. From now through December 18, 2013 these young people are collecting money to help provide these gifts. They want to make sure these children have more than a Christmas this year, they want them to hear about Jesus. Through Project Hope and your contribution, you’ll ensure they have both. 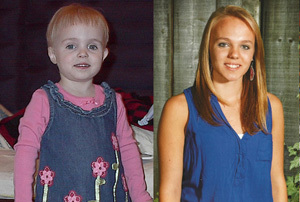 Anika Tuls before and now photo. Today, there are more than 700,000 children in the orphanage system in Russia alone. Since Russia has banned all adoptions to the United States, and more countries could be banned in months today come, these children have little hope of being adopted. That’s why this program is so important. It gives a child hope during one of the most hopeful times of the year — a time when Jesus brought hope to the world when he was born in Bethlehem more than 2,000 years ago. 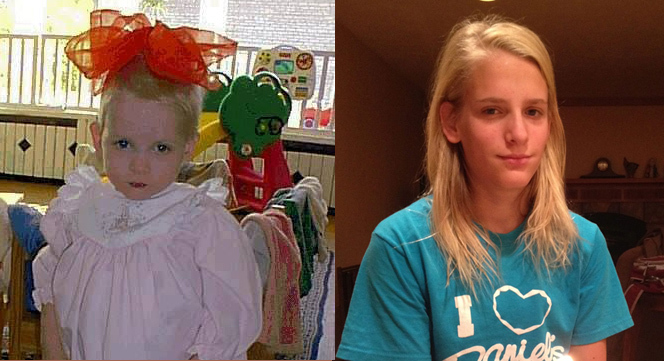 Katie and Matt Olsen before and now. Please give generously. $100 provides four Project Hope Christmas gifts. Your donation could make an eternal difference in the life of one child, or many children. It will also empower the Baptist Bible Church to have incredible impact in their community. You can give safely and securely on-line at https://www.YouCaring.com/projecthope. If you have questions, please email me your personal information at gregsyoder@gmail.com and I’ll get back with you asap. This entry was posted in Family, spiritual, Uncategorized and tagged christmas, gifts, gospel, orphans, project hope, russian ministries by christianradio. Bookmark the permalink.